By Niamh Webster, Scottish Government. This article was originally posted here. We’re currently working to create a new plan for the government to commit to for the next two years. We wanted to hear from people across the country about the improvements they would like to see and hear their ideas on how the government could be more open and accessible. 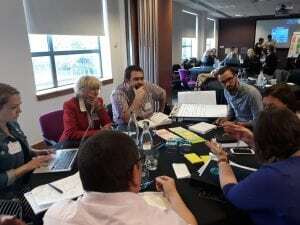 At the Scottish Government we have been working with the civil society network in Scotland to create a future where the government is more open, transparent and accessible, involves people and helps them to hold government to account. To do this, we needed people’s experience, expertise and ideas. We hosted public discussion events and engagement over the summer to hear people’s ideas. This report is a summary of all ideas we heard from the public discussion events and engagement over the summer of 2018. 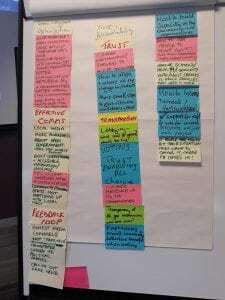 All of these ideas will feed into the creation of the Scottish Open Government Partnership Action Plan for 2018-20, due to be published Autumn 2018. Scotland is a member of the global Open Government Partnership – an international movement of governments around the world who are trying to lead the way on being proactive and innovative in opening up governments. 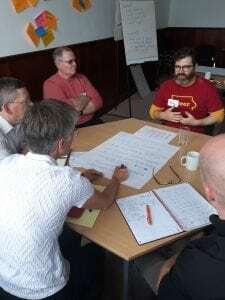 Pictures: groups discuss and contribute their ideas – what changes would you like to see in terms of a government that is more open, transparent and involves people? 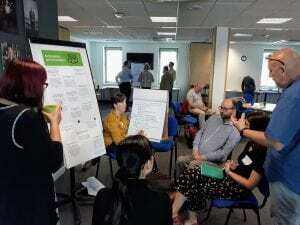 The outputs from all events, conversations and ideas was brought to a final event in Edinburgh on 21st August as the culmination of the engagement process. 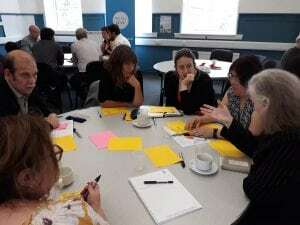 The purpose of the event was to refine the broad ideas into more specific commitments and prioritise the key themes to take into final discussions with Scottish Government policy teams for agreement and inclusion in the Action Plan. These themes were heard strongly and consistently through all engagement activities. We are currently working to develop specific commitments within these key themes which will form the basis of the action plan. 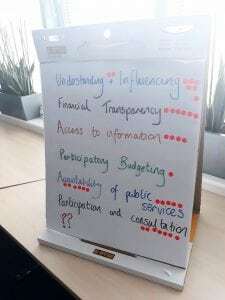 financial transparency – understanding the flow of money, transparency around procurement processes, accessible and understandable explanation of budgets and expenditure, citizen participation i.e. ongoing participatory budgeting. access to information – data and information in variety of accessible formats to help people understand government processes and decisions, and make participation easier. 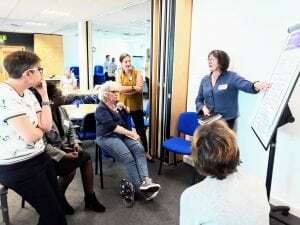 participation and consultation – more participative and deliberative processes, improved engagement practice, improving feedback and government consultations, education on democratic processes. 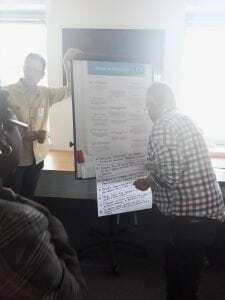 understanding and influencing – information on systems and processes so people can understand where to lobby or where can be involved, education on more participative processes, encouraging citizen journalism, apps for understanding and engaging in government processes. Thanks again to everyone who came along to our events, spoke to us or added an idea online. We provide regular updates on progress and recent news on this open government blog. You can also join the Open Government Network run by civil society partners – it’s free to join and connects you to interested people and organisations working on improving the future of openness and transparency worldwide.